First century Matthew! In 1994, that was how papyrologist Carsten Peter Thiede described Papyrus 64, three fragments written on papyrus, containing Greek text from Matthew 26 (to be precise, Matthew 26:7-8, 10, 14-15, 22-23, and 31-33). The fragments are housed at Magdalen College in Oxford, England, and they are for this reason called “The Magdalen Papyri.” Thiede’s case was a cumulative one, involving subtle factors such as the similarity of the lettering in Papyrus 64 and some of the lettering in the Dead Sea Scroll 4QLXXLev (4Q119). Papyrus 64 is indeed early, but subsequent researchers have responded to Thiede’s claim with strong arguments for assigning a later production-date to P64, around the beginning of the 200’s. This is from the same manuscript as Papyrus 64! 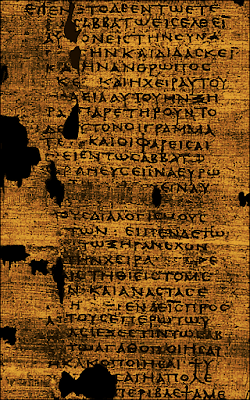 That was the verdict of Colin H. Roberts when he described Papyrus 67, a Greek fragment (presently housed at the Abby of Montserrat, west of Barcelona, Spain) with text from Matthew 3:9, 3:15, 5:20-22, and 5:25-28. Other researchers, after comparing the two manuscripts, have reached the same conclusion: although P64 and P67 were published separately and were assigned separate identification-numbers, they are really only one manuscript. Where did it come from? 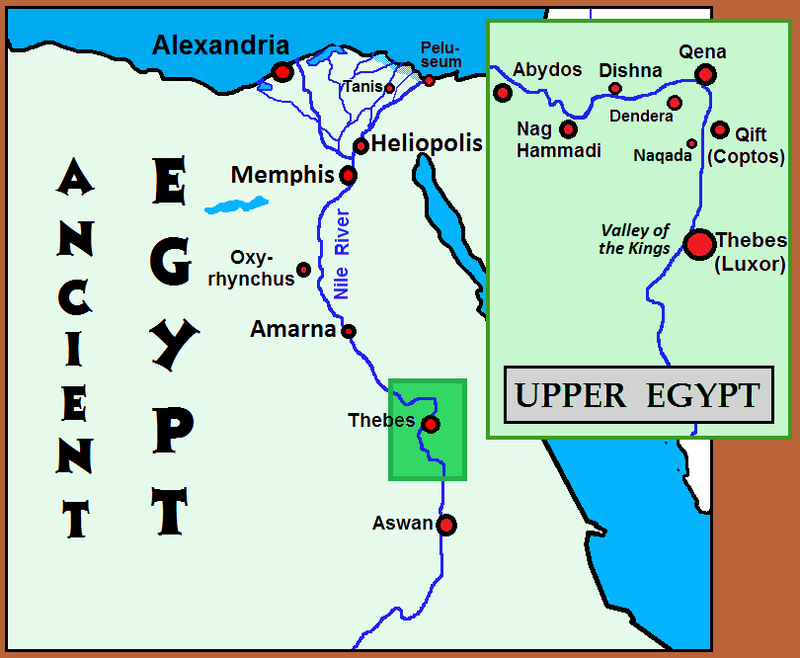 Probably somewhere in Upper (i.e., southern) Egypt – and therein lies a tale which implies that several important New Testament papyri come from the same place. The acquisition of P64 is no secret; it was purchased by Charles E. Huleatt in 1901 in Luxor, Egypt. North of Luxor, in the area of Naqada, are various monasteries. 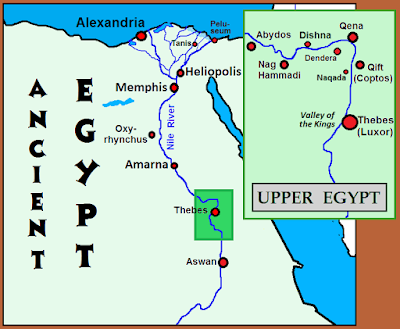 Northwest of Luxor is Nag Hammadi, where a collection of Gnostic texts were excavated. And northeast of Nag Hammadi is the town of Dishna – which is, as far as anyone seems to be able to tell, where a large collection of papyri were recovered – papyri which eventually ended up in the collections of Chester Beatty and Martin Bodmer. 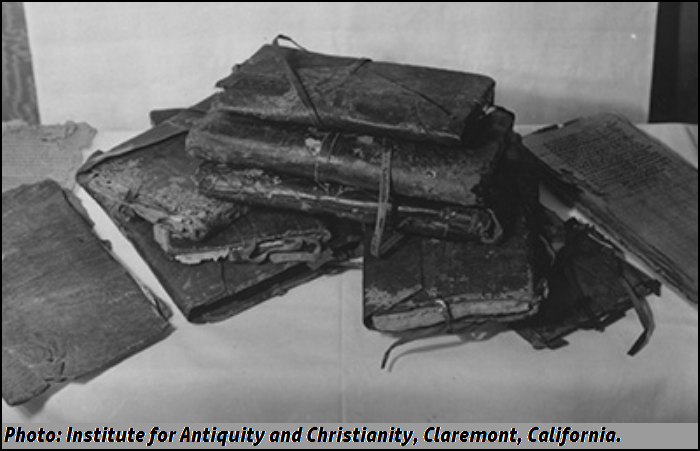 As specialist Dr. James Robinson has pointed out, the whole collection probably constitutes the remains of a Pachomian monastery’s library, hidden near Dishna in the 600’s, along with a variety of Old Testament manuscripts and other documents (some in Greek, some in Coptic), including copies of some letters composed by Pachomius. This means that when textual scholars rely upon Papyrus 66 (Bodmer MS 50), Papyrus 72 (Bodmer MSS 7-8), and Papyrus 75 (previously Bodmer MSS 14-15, but now housed at the Vatican Library and renamed the Hanna Papyrus), they are relying on manuscripts from Upper Egypt. A variant shared by P66 and P75 represents one, not two, locales. Papyrus 64 and Papyrus 67 were not part of the large collection found near Dishna; they probably came from a location east of there: the city of Coptos (now called Qift), which, after its citizens rebelled against the government, was destroyed by Roman forces acting on orders from the Emperor Diocletian in 292 (or later in his reign). What justifies this idea? Enter Papyrus 4. Papyrus 4 is a manuscript that consists mainly of substantial fragments from the opening chapters of the Gospel of Luke (1:58-59, 1:62-2:1, 2:6-7, 3:8-4:2, 4:29-32, 4:34-35, 5:3-8, NS 5:30-6:16), written in two columns per page. P4 also includes a heavily damaged page which appears to have been blank when produced, except for the book-title “Ευαγγελιον Κα[τ]α Μαθ’θαιον.” Papyrus 4 has been assigned to the late 100’s or early 200’s – the same era to which P64 and P67 have been assigned. The handwriting in P64, P67, and P4 is so similar that Colin H. Roberts (the researcher who identified and dated Papyrus 52 as a fragment of the Gospel of John from the first half of the 100’s) believed that all three manuscripts were actually parts of a single manuscript. Philip W. Comfort concurs with Roberts in this view. So did T. C. Skeat, who developed a theory that these fragments are from one early codex which, when pristine, contained the four Gospels. Scott D. Charlesworth, however, disagrees with Skeat’s theory, and has offered a nuanced case that at the very least, P64/67, and P4 could not be parts of the same single-quire codex. It is generally not denied, though, that the handwriting in all three fragments is very similar, which implies that these fragments share the same production-center or even the same copyist. If this is granted, then if one fragment’s source can be found, it is very likely that the source of the other two is the same. The source of Papyrus 4 is a known quantity, more or less. In 1889 (not 1880), someone found Papyrus 4 in the ruins of the city of Coptos, and within two years it was obtained by Vincent Scheil at nearby Luxor, along with a leather satchel-like cover and another papyrus manuscript. In the course of working on the New Testament papyri, I had the opportunity to study the originals very closely. I have thus found interesting details, and I had even the good fortune to make some small discoveries; one of them will be the subject of this article. This is the papyrus P4, published for the first time in 1892, and later in Memoirs of the French Archaeological Mission at Cairo by Father Scheil. It is now in the National Library [of France], under no. 1120, suppl. 2. After careful study of this document, I have found that some fragments have not yet been – as far as I know – deciphered and published. They constitute a larger part than the part already published, and their publication will not be without interest, especially since I can accompany it with photographic reproductions previously unpublished. I will give the entire text, for the parts already known call for some adjustments. Father Scheil pointed out to me last June that having bought a codex containing two treatises of Philo of Alexandria in 1891, he had the good fortune to find fragments of our biblical papyrus. The papyrus was found in Coptos, Upper Egypt, in 1889. [“1880” was a printing error.] Considered undoubtedly in ancient times as a very precious thing, it had been enclosed and walled up in a niche. The hollow sound of the wall in this place aroused its discoverers’ attention. After opening up the wall, they drew from this hiding place two treatises of Philo of Alexandria. The whole thing is in a known format, almost eight inches square, like the Arabic books. It was contained in a leather cover, with a tongue and a cord of leather falling on the cover. The book must have been squashed in its hiding place; the mortar was as if it were inlaid on the outside; the pages adhered strongly together in a mass, and were, in addition, fastened to one another by a quantity of small grains of salt [or sand], produced over the ages by a condensation-process in the vegetable tissue. Following the forty-fourth leaf [i.e., sheet, consisting of the front and back of a page], in the form of padding [“en guise de bourre”], I think, and to fill the capacity of the cover, there were several fragments of sheets stuck together. One of them contained κατα Μαθθιον, and the others, fragments of Saint Luke. Of the fourteen columns which compose the total, Father Scheil has published four of them. Father Lagrange has reproduced them in his Textual Critique (pp. 118-124). Father Scheil gave the papyrus to the National Library [of France]. I have not been able to ascertain, in spite of much research, the details of the conservation of this papyrus. A paper of April 24, 1913, written by Gregory, however, indicates that the restorer should be Doctor Ibscher of Berlin. along with two treatises by Philo. Although T. C. Skeat described Scheil’s discovery as “A papyrus codex, containing two works of Philo, in a leather binding which had been reinforced by leaves from a Gospel manuscript glued together,” some adjustments should be made to that description. 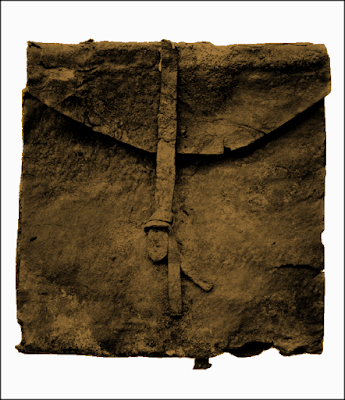 First, the cover being described is not a binding (like a book-binding); it is a leather satchel – basically a rectangular purse made to hold a manuscript slightly smaller than itself. Second, inasmuch as a page of the second treatise by Philo is stuck to the satchel – meaning that P4 was inserted between this page and the rest of the pages of Philo’s treatises – this means, it seems to me, that the pages containing text from Luke were not added merely as padding-material. It is easy to see how a person could slide a second manuscript alongside the first one, and not notice that a page of the first manuscript had been caught behind the second manuscript, if the purpose was merely to store them both in the satchel. But it is much more difficult to imagine that anyone would insert discarded pages into the satchel, as permanent padding, without noticing that a page of the Philo-volume was intervening between the padding-material and the leather satchel itself. When Vincent Scheil first analyzed Papyrus 4, he assigned it a production-date in the 500’s. This does not interlock well with the premise that the wall from which P4 was taken collapsed (with P4 and the two treatises of Philo within a leather satchel-cover inside it) in 292 or shortly thereafter. Scheil did not explain the basis for dating P4 so late; perhaps he thought that the wall’s collapse did not occur until the 500’s. In any event, practically everyone else has assigned a much earlier production-date to the manuscript, usually a period around 200. However, a substantial part of the argument for that date depends on the premise that P4, when it was placed in the leather satchel with the two treatises of Philo, was used as padding – the idea being that only decayed or damaged pages would be recycled as padding-material, and that some time would need to be posited between the production of P4 and the time when it was considered suitable only for use as padding-material. If that is the case, and if Roberts, Skeat, and Comfort are correct in their view that P4, P64, and P67 are parts of the same manuscript, then it implies that either (a) P64 and P67 were part of the initial find in 1889, and were taken away from the rest, before P4 was obtained by Scheil in 1891, or (b) the manuscript was indeed in a state of disrepair when part of it (the P4 part) was recycled as padding, and the rest of it (of which P64 and P67 are the surviving representatives) was set aside elsewhere. Another possibility – somewhat imaginative, I grant – is that a group of Gospels-readers at Coptos in the 200’s had a single unbound Gospels-codex to share among themselves, and they divided it into parts, one of which was eventually hidden with the Philo-treatises when the city was under siege in 292, one which survived elsewhere (barely) as P64+67, and the rest of which is lost. I suspect that P64+P67 constitute part of an unbound codex (not a single-quire codex) that contained the Gospel of Matthew and the Gospel of Luke together. 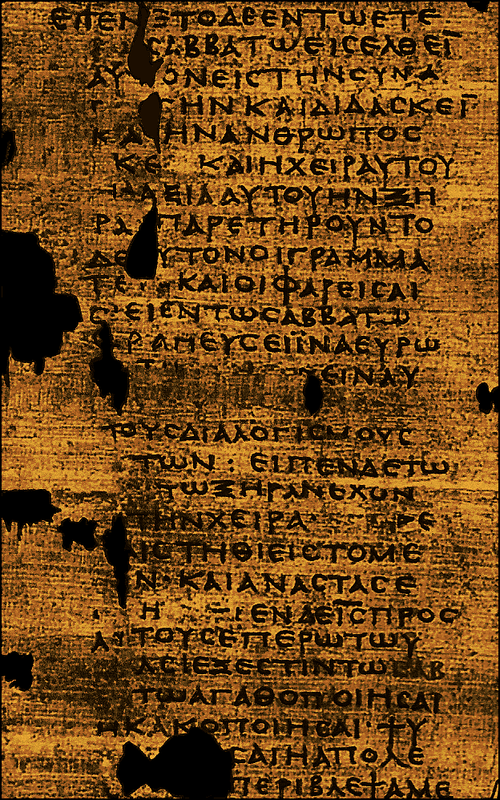 The page with “Ευαγγελιον Κα[τ]α Μαθ’θαιον” written on it is, in this case, the final page of the Gospel of Matthew – that is, we see here the closing-title of the Gospel of Matthew, not a flyleaf or opening title-page. P4 was probably produced by the same copyist, but not necessarily at the same time as the volume of which P64 and P67 are the surviving parts. (1) Even before the establishment of Pachomian monasteries in the region, there was a Gospel-reading community in Upper Egypt, and its Gospels-text is represented by P4, P64, and P67. (2) The Alexandrian text of Matthew and Luke was in use in Upper Egypt in the mid-200’s. (3) The arrangement of the text in a format of two columns per page is not a sign of lateness; it was used in the 200’s. 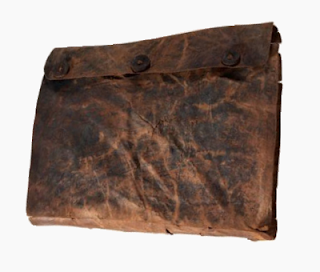 (4) Reckoning that P4 was not used as binding-material, but was kept in the leather satchel alongside the two treatises of Philo (and also reckoning that P4 is a separate manuscript from P64/67), there is no impetus for the assumption that its pages had worn out prior to being placed in the leather satchel, and this may justify a production-date closer to the mid-200’s rather than around 200. ● The Earliest Manuscript Title of Matthew’s Gospel (BnF Suppl. gr. 1120 ii 3/P4, by Simon Gathercole (downloadable at Academia.edu, for which membership, needed to download documents, is free), published in Novum Testamentum in 2012. Gathercole provides a clear photograph of the page of P4 which has the title of the Gospel of Matthew written on it. He transcribes the title (correcting earlier editors’ mistakes) and describes the page insightfully. Yet I disagree with his view that this page is a “flyleaf.” It seems more likely that it is a page from a codex in which the text of the Gospel of Matthew ended neatly at the end of the preceding page, and what we see on this page is the closing-title. ● The Oldest Manuscript of the Four Gospels?, by T. C. Skeat, is a chapter in The Collected Biblical Writings of T. C. Skeat, beginning on page 158. This volume was edited by J. K. Elliott and most of the essay is accessible at Google Books. Skeat maintained that P64, P67, and P4 are all parts of the same manuscript. He provided plenty of interesting information about small but significant aspects of the manuscript, such as the similarities between its section-divisions and the section-divisions in Codex Vaticanus. ● T. C. Skeat and the Problem of Fiber Orientation in Codicological Reconstruction, by Scott Charlesworth, is a somewhat technical essay in which the author presents obstacles against Skeat’s view that P4 is part of the same manuscript as P64 and P67. 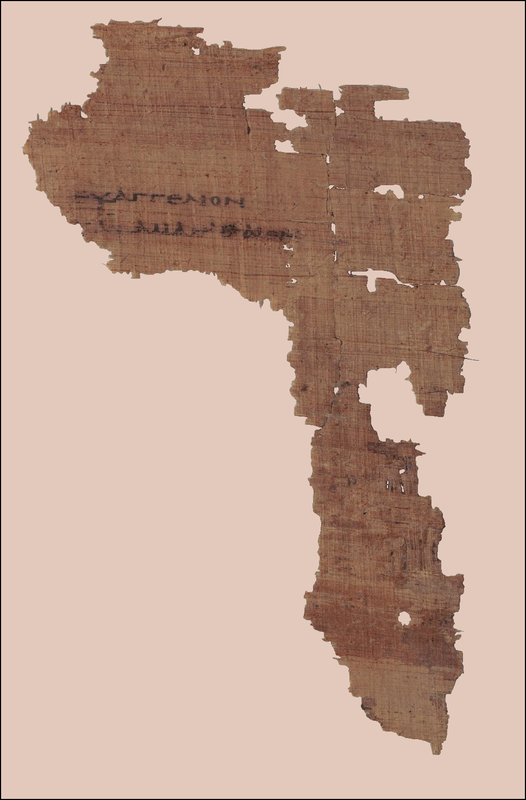 ● Papyrus Magdalen Greek 17 (Gregory-Aland P64) – A Reappraisal, by Peter Carsten Thiede, features his proposal, in 1995, that P64/67 is a manuscript from the first century. Thiede provides a transcription and photographs. ● The Date of the Magdalen Papyrus of Matthew (P. Magd. Greek 17 = P64): A Response to C. P. Thiede, by Peter Head (initially published in Tyndale Bulletin in 1995) tests and effectively refutes Thiede’s dating of P64 and P67 to the first century. ● Prior to the introduction of Pachomian monasticism, were the New Testament manuscripts in Upper Egypt made by orthodox Christians, or by groups such as the Gnostics in nearby Nag Hammadi? Even the discovery of a manuscript in the collection of a monastery is no guarantee of the orthodoxy of its text, for many a monk may have studied his theological opponents’ writings so as make a knowledgeable reply against them. ● Is there a connection between the codex-production methods used in Upper Egypt, and the methods used in Ireland? A link between Upper Egypt and Ireland may seem unlikely, until one notices the popular use of leather satchels in both regions, a persistent tradition about seven Egyptian monks who worked in western Ireland, similarities in some Irish and Egyptian book-illustrations, the papyrus-padded cover of the Fadden More Psalter, and occasional rare readings shared between Egyptian Greek and Irish Latin manuscripts. ● Can manuscripts’ texts be grouped according to the methods used to divide the text into sections? The ways in which scribes divided the text into paragraphs may shine some light on historical connections between manuscripts. Perhaps the text-divisions in manuscripts should be handled the same way textual variants are treated. If the Faddan More Psalter is the one that was famously found opened to Psalm 83, then the papyrus-lined cover was found at a different time and place. Yes; of course it was found at a different time and place -- the thing to see is that a MS found in Ireland had a cover lined with //papyrus//. Ijaz Ahmad said nongbri has dated P4 to 4th century? Is this true?